The grandson of slaves, born into poverty in 1892 in the Deep South, A. G. Gaston died more than a century later with a fortune worth well over $130 million and a business empire spanning communications, real estate, and insurance. Gaston was, by any measure, a heroic figure whose wealth and influence bore comparison to J. P. Morgan and Andrew Carnegie. Here, for the first time, is the story of the life of this extraordinary pioneer, told by his niece and grandniece, the award-winning television journalist Carol Jenkins and her daughter Elizabeth Gardner Hines.Born at a time when the bitter legacy of slavery and Reconstruction still poisoned the lives of black Americans, Gaston was determined to make a difference for himself and his people. His first job, after serving in the celebrated all-black regiment during World War I, bound him to the near-slavery of an Alabama coal mine—but even here Gaston saw not only hope but opportunity. He launched a business selling lunches to fellow miners, soon established a rudimentary bank—and from then on there was no stopping him. A kind of black Horatio Alger, Gaston let a single, powerful question be his guide: What do our people need now?His success flowed from an uncanny genius for knowing the answer.Combining rich family lore with a deep knowledge of American social and economic history, Carol Jenkins and Elizabeth Hines unfold Gaston’s success story against the backdrop of a century of crushing racial hatred and bigotry. Gaston not only survived the hardships of being black during the Depression, he flourished, and by the 1950s he was ruling a Birmingham-based business empire. When the movement for civil rights swept through the South in the late 1950s and early 1960s, Gaston provided critical financial support to many activists.At the time of his death in 1996, A. G. Gaston was one of the wealthiest black men in America, if not the wealthiest. But his legacy extended far beyond the monetary. He was a man who had proved it was possible to overcome staggering odds and make a place for himself as a leader, a captain of industry, and a far-sighted philanthropist. Writing with grace and power, Jenkins and Hines bring their distinguished ancestor fully to life in the pages of this book. 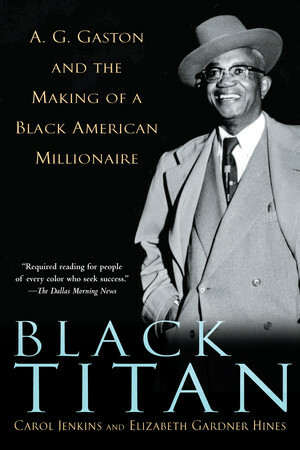 Black Titan is the story of a man who created his own future—and in the process, blazed a future for all black businesspeople in America. Chairman and CEO, Earl G. Graves Ltd.
CEO, Black Entertainment Television, Inc.
willpower, determination and a plan. Pick any sweltering day in the year 1919. On the outskirts of Birmingham, Alabama, in a small mining village, hundreds of black men are at work, side by side. The old-fashioned broiler that is the Alabama sun beats down hard upon them, and to a man, each is afloat in his own sweat. In the ground beneath their feet, men less lucky than they swim in the blackness of the pits. Thousands of pounds of iron will emerge as a result of their labor; and thousands of men will die in its pursuit. Some of the men you see and cannot see are convicts, leased out by the state to bring in revenues; some are war veterans, newly returned to face few opportunities and ample disdain. Nevertheless, one of these men, bruised like all the others by the demands of his working life, is on the verge of taking his first step in the direction of becoming a bona fide millionaire-one hundred times over. Before this man is through, he will serve as an adviser to President John Kennedy. He will play a pivotal role in the American civil rights movement. One day he will even be likened to the great giants of American industry-Rockefeller, Morgan, and Carnegie among them. Like just about every other black man in Alabama in the early part of the twentieth century, A. G. Gaston started with next to nothing: His mother was a cook in the kitchen of a prominent white family; he never had more than a tenth-grade education. After the war he had taken his position in the mines as a means of survival-only to emerge utterly determined that his life was worth more than what the mines were offering. That determination was a kind of miracle given the context in which Gaston had been raised. And that miracle is the foundation of the story you are about to hear. The exiles named their new home Demopolis-“city of the people”-and re-created there a French village called Aingleville. They had come with the intention of coaxing groves of olives and grapes from the region’s fertile soil, founding the Olive and Vine Colony toward this end. However, the combination of unsuitable growing conditions for their preferred crops and the inexperience on the part of the settlers resulted in a magnificent failure in production. According to legend, the exiles were comically unprepared for rural life; men and women alike were said to tend to their farming duties in full court attire. Not a few of the exiles quickly succumbed to the harshness of the agricultural regime, and many of those who survived fled back to Paris once amnesty had been granted to them by the new, more reasonable King Louis Philippe.